This awesome "Bullet Holes" is one of Jeri's favorite designs, and one her friends own! We don't create this strap often, but we have a display version in stock. This is a labor intensive strap, so we don't offer them for sale on a regular basis. 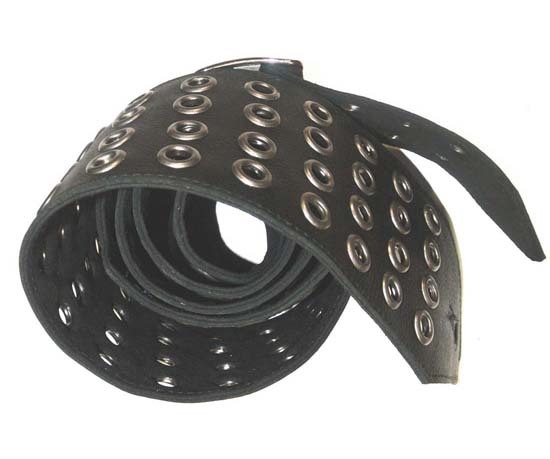 This strap is created with a gorgeous Black Chap leather, cut to 3.5 inches wide. The strap is then hand punched and embellished with rows of 4 blackened nickel eyelets. We finish this strap off with our signature buckle system, with a blackened nickel buckle. This is a great strap for great for bass players and heavy guitars, as this strap really distributes the weight of your guitar! We have one of these display straps in stock, in our Long length. Snag it at a great price, we don't make these for just anyone!